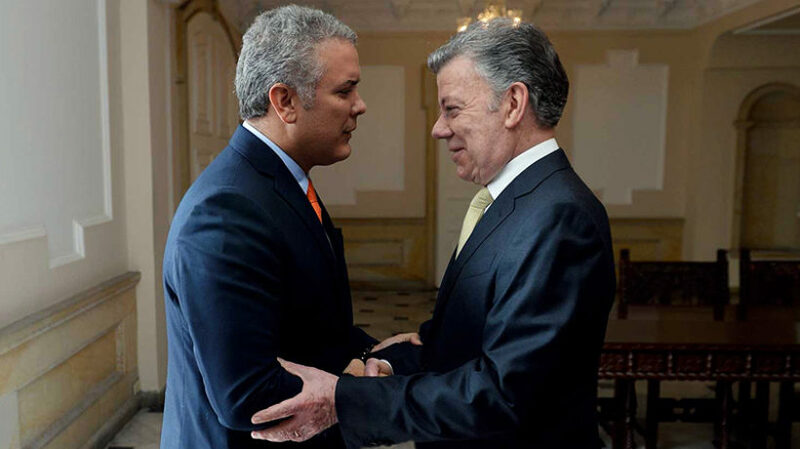 New rightwing Colombian President Iván Duque formally took office yesterday with an inauguration in Bogotá. Duque, a a rightwing conservative groomed for the presidency by former President Álvaro Uribe, assumes the role of head of state at a time when the nation is deeply divided over, among many issues, a peace deal that more than half of Colombians initially voted against. He has pledged to alter that accord, which earned outgoing President Juan Manuel Santos the Nobel Peach Prize before it was formalized in late 2016 to end more than a half century of conflict with the now-demobilized leftist guerrilla group Revolutionary Armed Forces of Colombia (FARC). 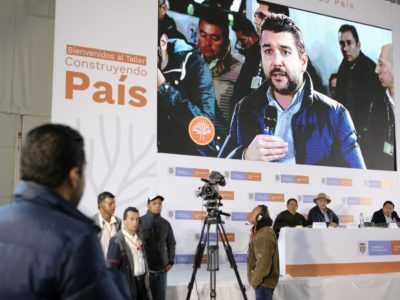 At the inauguration, as reported by the Associated Press, Duque said he believes in the “demobilization, disarmament, and reinsertion of the guerrilla base” into society. As during his presidential campaign, however, he stressed that “we will make corrections” to the peace deal.” The nature of those changes will have significant political ramifications, particularly with his mentor Uribe facing a criminal investigation into allegations of witness tampering and bribery. 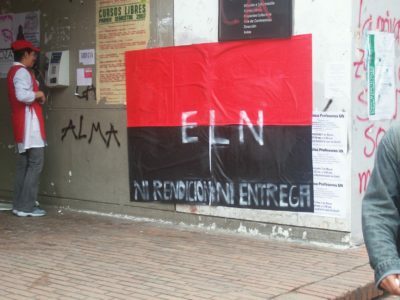 Duque also plans to take a more hardline approach toward fighting the last remaining guerrilla group — the National Liberation Army (ELN), which Santos began formally negotiating a peace deal with in 2017 — as well as surging coca production figures that have tested Colombia’s close relationship with the United States. By comparison, overseeing a now-improving economy should be relatively less complicated. Colombia’s gross domestic product (GDP) increased by just 1.8% in 2017, the lowest level since the height of the global financial crisis in 2009 and well below the potential highs above 6.5% last registered in 2014 (and three times since 2006). Last year’s underwhelming results followed growth of just 2.0% in 2017. But most analysts project better economic performance in 2018 and into the foreseeable future. Higher oil prices have been one key aspect of the improvement, with a return to moderate inflation rates, higher consumer confidence, and an extended interest-rate cutting cycle by the central bank also assisting in the recovery. Estimates from leading global and financial sector analysts for growth in 2018 top out at around 3%. Other more pessimistic forecasts published this year — including those by top independent researchers in Bogotá — have set expectations closer to 2.4%. Nevertheless, this represents a reversal of the four-year streak of falling growth rates in Colombia, and most of the same organizations expect further recovery in 2019. Medellín-based Bancolombia, the Andean nation’s largest bank, expects just 2.6% growth this year but 3.2% growth in 2019. “We expect the macroeconomic and financial conditions for productive investment to continue improving,” said the bank in a note to investors last month. Though higher GDP growth will ease some of the concerns that have vexed officials in Bogotá for the past two years, large challenges remain ahead. “Among the many challenges the new administration will have to face, those concerning the economy are not minor,” stated Bancolombia in a note to investors. Most notably, the new administration will face difficulty in abiding by the governing fiscal rule that mandates an ongoing reduction in the nation’s fiscal-deficit-to-GDP ratio. Last year, the country was able to push this ratio below the outlined threshold of 3.6%. But this rate must drop further in 2018 and beyond, and hitting the figure last year was achieved, at least in part, due to one factor outside of the government’s control (rising global oil prices) and a one-time unexpected windfall (nearly $1.5 billion USD in telecom fines). Credit rating agencies in New York, as well as Bancolombia, have questioned whether the nation can continue to hit its marks after 2018. Failing to do so would jeopardize Colombia’s investment-grade rating that the Ministry of Finance under Santos fought hard to maintain. Prior to Duque’s inauguration, Congress proposed its version of the federal budget for 2019 and it included cuts. Now in office, Duque will have the chance to review and amend the proposal, with the final budget requiring approval from the new Congress. But the reality of austerity may mean that Duque will walk back one of his key campaign talking points. 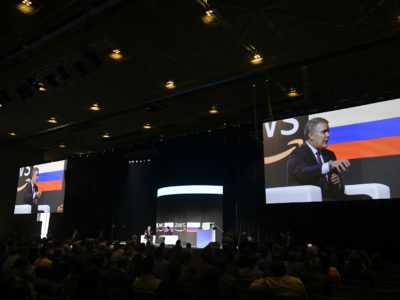 Bancolombia, however, has looked at the still-high oil prices and noted that this new reality could lead Duque to believe tax cuts and the fiscal rule might be compatible. The international investment community will be watching closely as Duque sets his economic agenda in the weeks and months to come. New York rating agency Standard & Poor’s cut its sovereign rating for Colombia to BBB-, just one notch above junk, last December. Moody’s Investors Service, another of the big three agencies, maintained its Baa2 rating for the nation in February but did move its outlook from stable to negative. Fitch Ratings, which affirmed its BBB rating with a stable outlook for Colombia in May, has had its eyes on the upcoming budget decision even since before the election.